As an avid numismatic, I love the United States Mint in Philadelphia. My husband knows where to buy gifts for me 😊 To celebrate the 225th Anniversary of United States Mint in the data way, here is the story in numbers. I find that the production fluctuates with the health of the economy. You can notice a pronounced dip during the great depression and the recent recession. Also, there was boost in production with the stimulus packages. 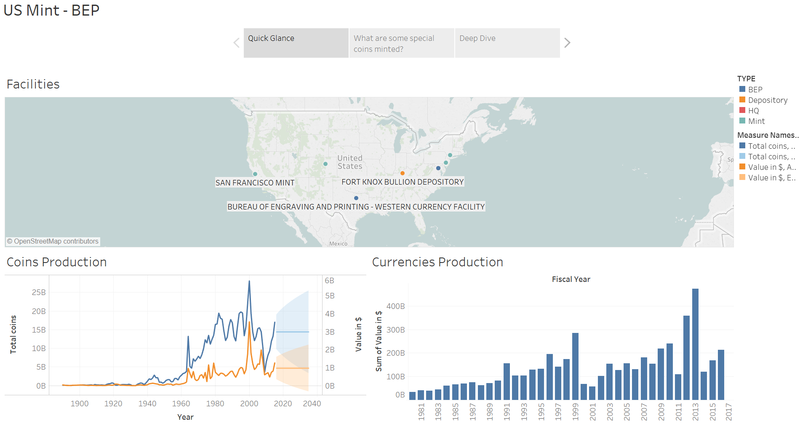 This entry was posted in Visualization and tagged 225th anniversary, BEP, data visualization, Tableau, United States Mint. Bookmark the permalink. The postings on this site are my own and do not necessarily represent the opinions of CapTech Ventures, Inc.